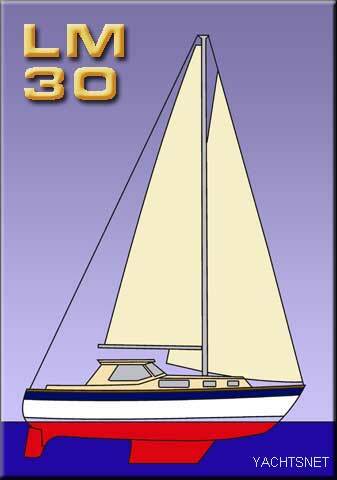 The LM30 is a double-ended Scandinavian motor-sailer, built to a high quality standard. Although clearly a motor-sailer, the LM30 is actually a surprisingly good sailing boat. They were designed from the outset to be easy to handle, with all lines led back to the well protected cockpit. This is a shallow fin keeled version. 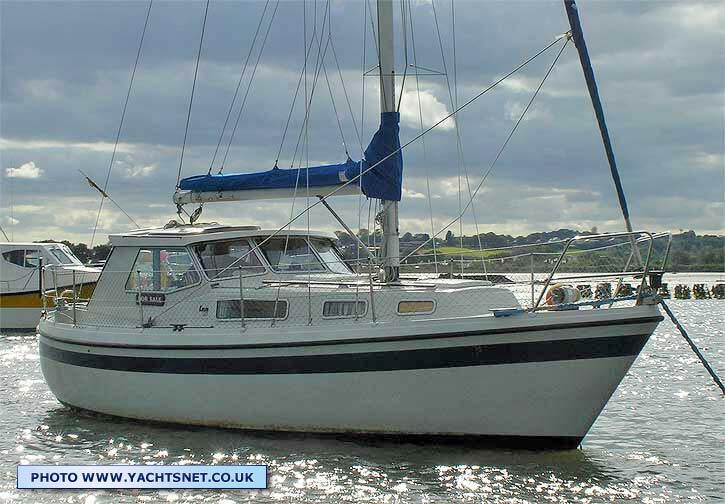 We sold this boat to the present owners in 2015, and she is for sale again now only because of health issues. A walk-on pontoon mooring in Southampton is available and paid up to October 2018. Above the waterline the LM30 looks much like a larger version of the smaller LM27, but whereas the LM27 has a long shallow full keel, the LM30 has a much more modern sailing-oriented underbody with either a single fin keel or twin bilge keels, and skeg-hung rudder. Overall lengths of 30' 8" and 31' 10" are both quoted in various sources for the LM30: it is probable that the differences arise because of variations in measurement points - the stern extends aft further than at deck level. Designed by Bent Juul Andersen and built in Denmark by LM Glasfiber from around 1980 to 1990, the LM30 moulds were later moved to England, where production continued as the Scanyachts LM30 and later LM32 (this being based on the same hull mould, and is virtually identical). LM started life as a furniture factory - and this shows in the quality of the cabinetwork on their yachts. In the early 1990s LM ceased production of boats to concentrate on making GRP blades for large wind turbines, in which field they are now the largest company worldwide. Although a motor-sailer, she is also designed to sail. 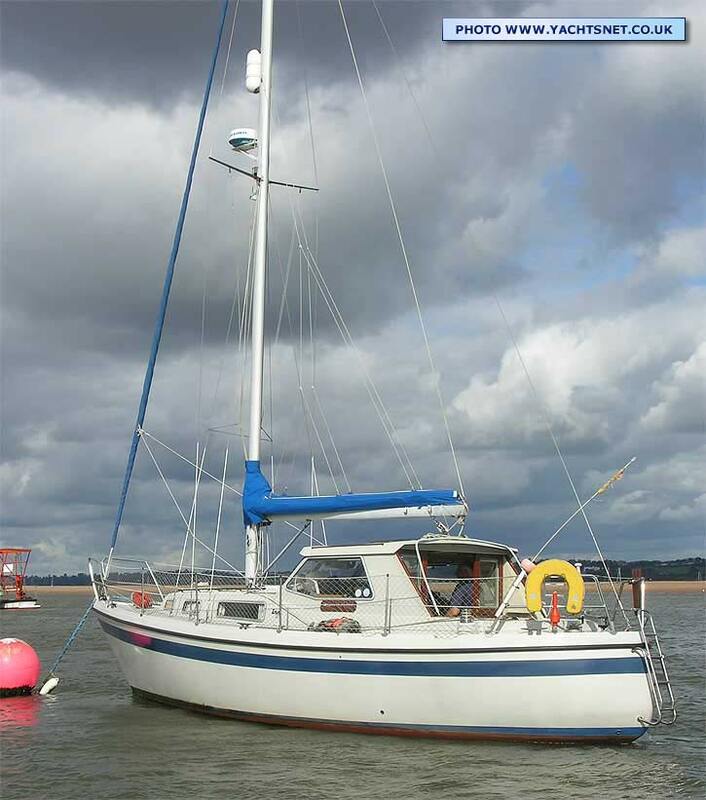 In 1986 "Practical Boat Owner" reviewed the design, saying ".... as a sailing boat she is faultless" and "... under power she is completely obedient, able to manoeuvre with very little way and unaffected by wind direction"
Photos ashore and interior almost all from August and September 2017: photos afloat in previous ownership. The wheelhouse contains the main helm position, and the galley. The hatch over the interior helm position opens, both for fresh air, and so that if desired you can stand at the wheel with your head out for a complete 360 degree view (although the visibility from the inside of the wheelhouse is already fairly good). There is a slide-out helmsman's seat that extends to seat two. A fridge is fitted under the helmsman's seat. All sail handling can be carried out from the cockpit, with single-line slab reefing and lazyjacks for the fully battened mainsail, and roller reefing headsail. The LM yachts are built to a high standard, with a lot of clever detailing. The LM30 has both a wheel in the wheelhouse and a tiller in the cockpit - though the present owner tends to mainly use the wheel and has removed the wooden tiller arm whilst the boat is ashore. The Bukh engine is under the removable cockpit sole, with a second inner cover to reduce noise. The engine casing is also sealed from the rest of the hull. The engine was replaced with a reconditioned unit in January 2015, and has run approx 110 hours since then. - in all these photos the tiler is removed from the rudder head. Bukh DV20 installed January 2015 as reconditioned unit, freshwater cooled, run approx 110 hours since then.